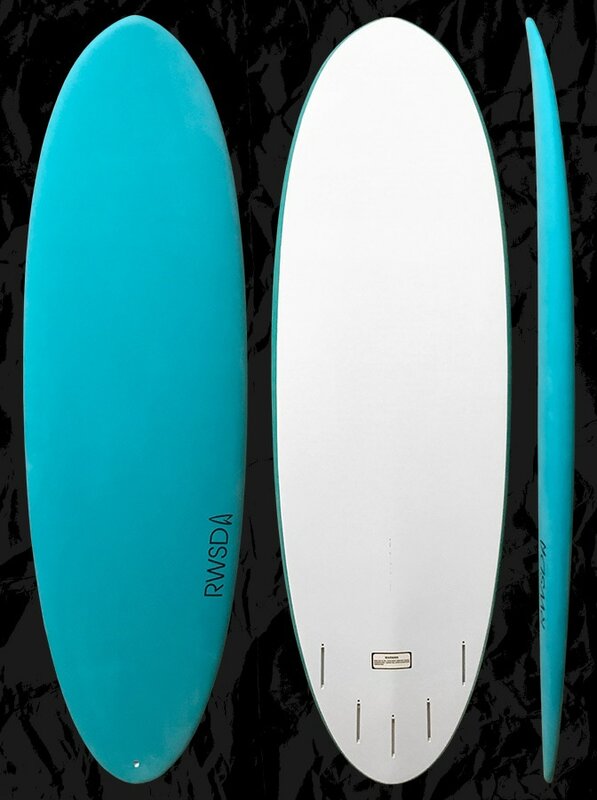 Most ‘soft top’ boards are clunky and don’t have design elements built in to help the surfer. In fact those boards are often holding the beginning and even more advanced surfers back from having all the fun they want. With progression in skill and maneuvering in mind, our Epoxy Soft Wrap Technology designs are for all levels of surfers. Each ESWT board is made with the same proven rockers, bottom contours and fin placements found in our other constructions. And since beginners need more board than advanced surfers, we adjust the rails to work ideally for their suggested weight in each size. These tailored rails help in angling across the wave face as well as turning with ease and control. This also translates to the more advanced surfer so the board’s rails don’t feel too full compared to their normal boards and lets the board go where they want it. ESWT board construction starts with a shaped EPS foam blank. Then they are glassed in 6oz Dow EBS fiberglass and epoxy resin from Resin Research with two layers of the fiberglass on top and one layer on the bottom. After the Futures fin boxes are placed and the cured board is sanded, a coating of Imron paint is applied to the bottom. In the next step, a solid single layer of soft EVA foam is applied to the deck and around the rails of the board with 3M glue. Then the board is vacuum bagged for improved strength and foam adhesion. Lastly the bottoms of the rails are sanded, adding to the board’s performance. Do you or your kids dream of catching waves and having fun? The Dream Machine is one of our popular Groveller models that is great for learning to surf as well as it is a small wave crusher for the higher level rider. Designed for small waves it has a wide and stable outline. This gives it glide and makes it easier to stand on for beginners. Its nose has a slight flip to help prevent it digging in on drops. It has a rounded tail that makes for smooth turns on the open face. On the last 8”of the tail it is tapered in to aid in release. It is fairly thick compared to its length so that it can catch waves easily. For the Dream Machine in Epoxy Soft Wrap Technology, the rails are slightly thinner than our other constructions. This helps the board turn easier for beginners learning the basics to more advanced surfers wanting to push performance. Medium for stability and float, tucked hard edges for speed and holding power, soft rails in the front third of the board to reduce bite and make the board more forgiving. Single to deep double concave out the back with a slight V at the end of the tail. Five fin set up in Futures Boxes for thruster or quad. For kids and beginners we suggest using Pro Teck fins. Beyond beginners can use their favorite Futures templates such as the Roberts Medium for lighter riders and Roberts Large for heavier. Small, fat or flat faced waves up to shoulder high. Refer to the sizing chart on this page matching your weight and skill level to the size of the board. For beginners 5’6 and under 180 lbs can use the 5’10 for their first stages of learning and the 5’4 if they already know how to pop up. For Beginners over 5’6 and/or up to 180 lbs use the 5’10 for their first stages. For beginners over 5’6 and over 180 up to 215 pounds use the 6’4 for their first stages. Please feel free to use our CONTACT US form on this website to receive more info about our boards and sizing.